Nick and Norah's Infinite Playlist has one great thing going for it, and it's in the name. This is a movie with a rich and populous soundtrack, full of rhythmic, eclectic, and understated songs by some very talented artists, including Chris Bell, The Real Tuesday Weld and Army Navy, among others. Their mellow acoustics and nondescript lyrics are meant to be universally appealing and generate a soothing, relaxing and euphonious listening experience. The filmmakers obviously have great affection for music and its artists, who are probably the most influential artists in our daily lives (next to graphic designers), and had the movie had been more about humanity's love of music instead of its wandering and predictable plot, it would have really been something special (think Almost Famous for a slightly younger generation). But it ultimately walks down a road we've traveled several times before, with the only difference being its sweet sound. This is yet another romantic comedy where you only have to see the trailers to know the outcome of the story. I know that's more or less a given for the genre, but I was at least hoping it wouldn't throw this many cliches into its mix. In the movie, Nick (Michael Cera of Superbad and Juno) is a high school senior who plays bass guitar in a band called The Jerkoffs. He's depressed because his girlfriend, Tris (Alexis Dziena), has recently dumped him. He tries to win her back by leaving her long-winded phone messages and making her mixed CDs. 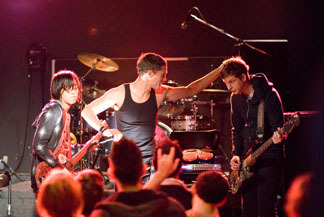 Nick's colorful band mates - Thom (Aaron Yoo) and Dev (Rafi Gavron) - are gay, and when they tell him they have a gig that night, he tells them he's taking a mental health day - "You don't know how tough it is to be straight." They convince him to come along and promise to seek out a notoriously hidden band called Where's Fluffy? So Nick stuffs his guitar into his yellow Yugo and heads into Manhattan. Norah (Kat Dennings), another high school senior, also embarks on a mission to find the band with best her friend Caroline (Ari Graynor). As it turns out, Norah goes to the same high school as Tris and has been listening to Nick's mixed CDs after Tris throws them away. Of course, Norah is made out to be the polar opposite of Tris - she's humble, thoughtful and organic. She's also devoted to the well being of her friends. Tris is your typical snob - superficial, selfish, dissolute. As such, her character is a device whose only purpose is to suggest the two main characters might not end up together. Like that would ever happen.